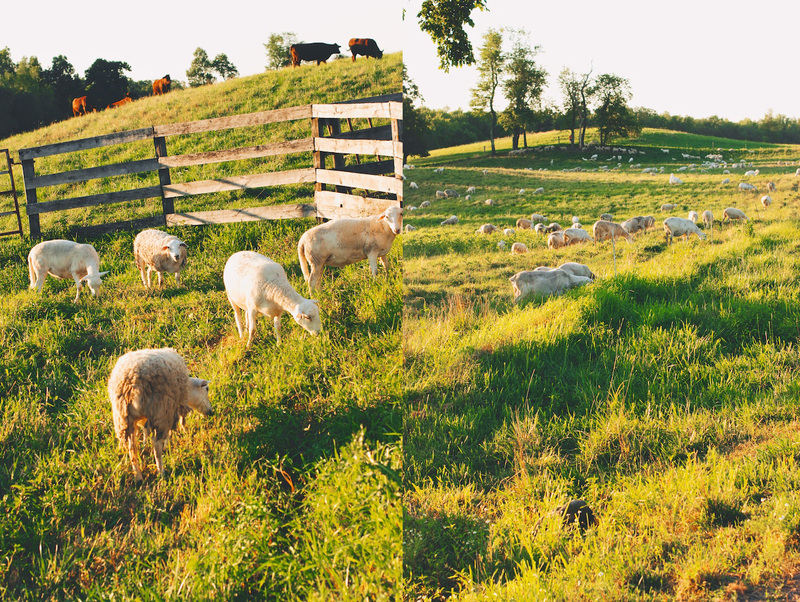 Kinderhook Farm is impossibly bucolic, verdant, and lovely; such a stark contrast from the noisy, rush-about city. The renovated barn where we stayed had soaring ceilings and stripped wooden floors that creaked slightly, satisfyingly under bare feet. 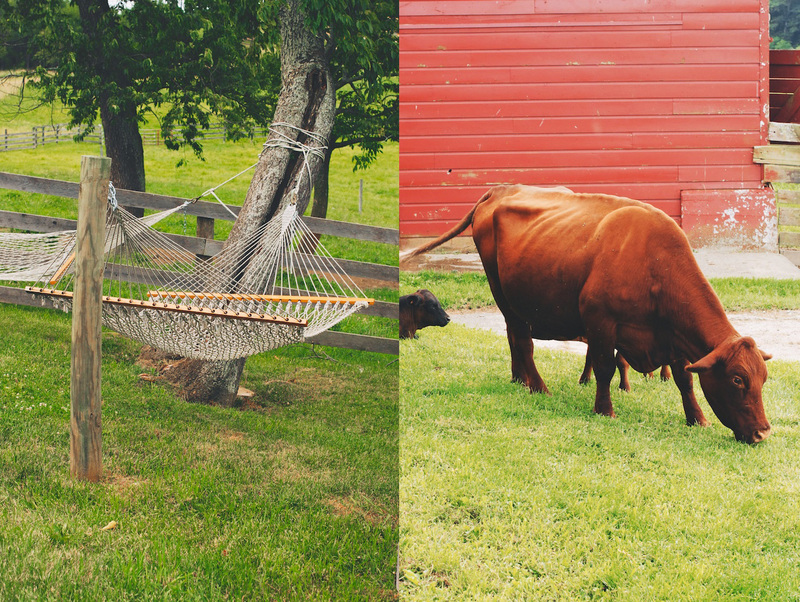 We spent much of our time shuffling languidly between the wide, open kitchen and the picnic table/double hammock situation in the yard, although I won’t soon forget the view from the shower: yawning pasture, stretching greenly in three directions. When not power relaxing, we took advantage of the locale. 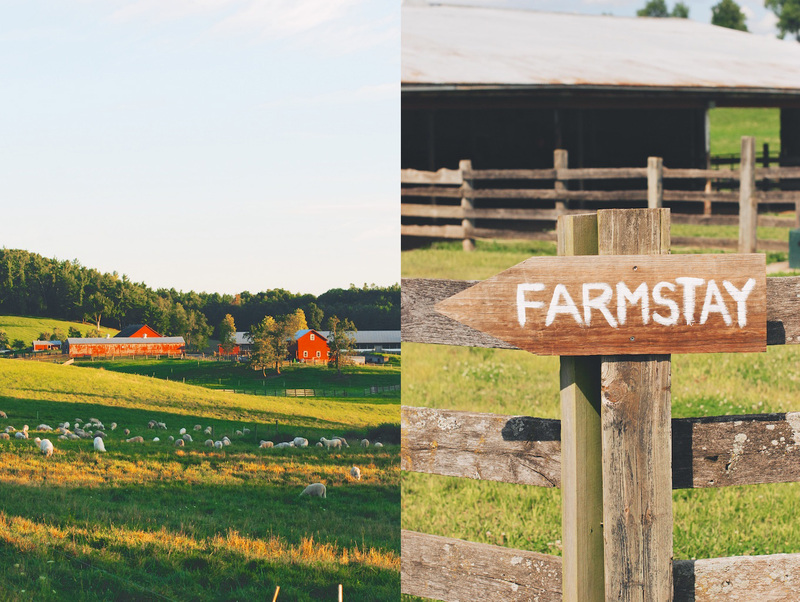 Because the Frenchman is a patient man, he chauffeured me to at least ten separate farm stands, where I bought our weight in peaches, tomatoes, sweet corn, zucchini, melons, herbs, cheese, local beer by the growler, wine, apple cider doughnuts, and other tiddly-bits besides. 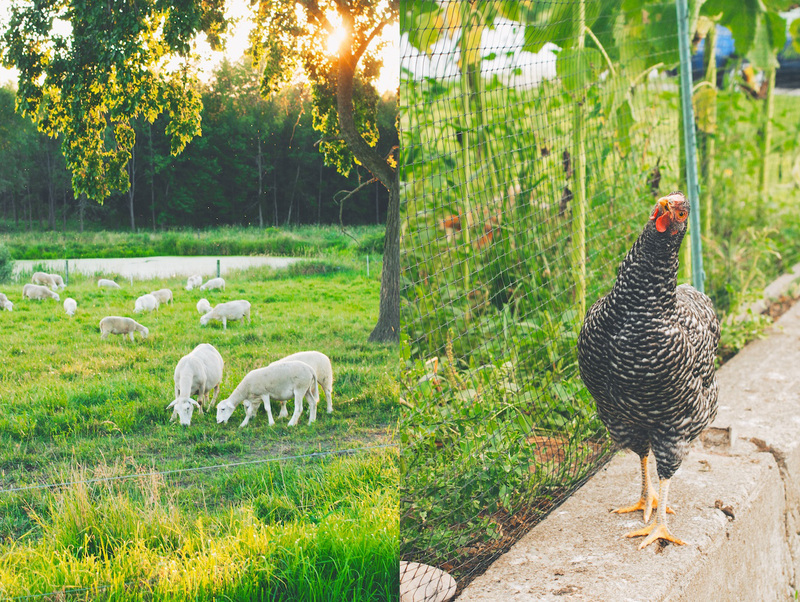 At the farm store, I stocked up on lamb, beef, chicken, and fresh, multi-colored eggs. We grilled like it was going out of style. Otherwise, we hiked. I do not enjoy hiking. I was bitten by an insect (a series of insects?) that left sundry, silver dollar-sized welts on my legs. But here is the thing–when a man agrees, amiably and without fuss, to spend the better part of Saturday morning watching you select blueberries, you go hiking. That’s how love works. On our last evening, we walked through dewy grass to share drinks with the farmers, their co-workers, and friends. We grilled pizzas scattered with pesto and more vegetables than should be loaded onto pizza dough, strictly speaking. The Frenchman built us an impressive fire, and we sat next to it, drinking whiskey and chit-chatting. When I got cold, he fetched me his sweater. Above us, the sky was dappled with an outrageous, sweeping, miraculous banner of stars. It feels a little like cheating, to offer you a recipe so heavily borrowed from someone else’s idea. 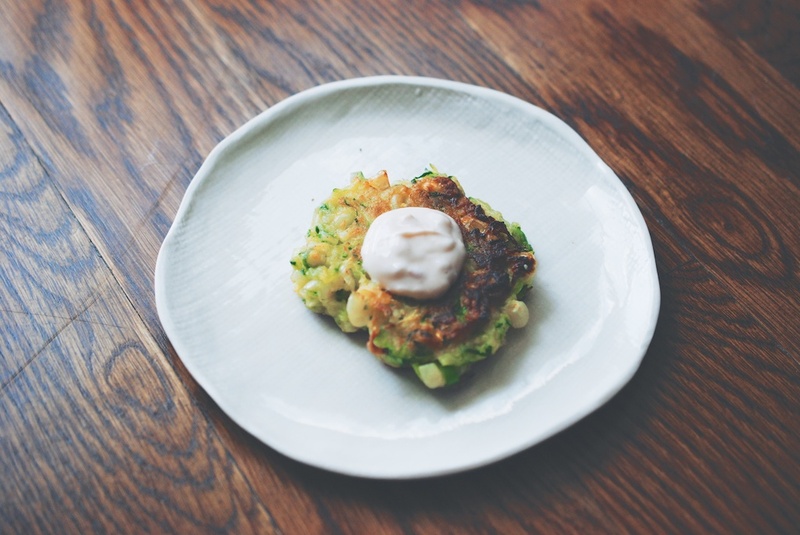 But here’s the thing: these fritters are so damn tasty. 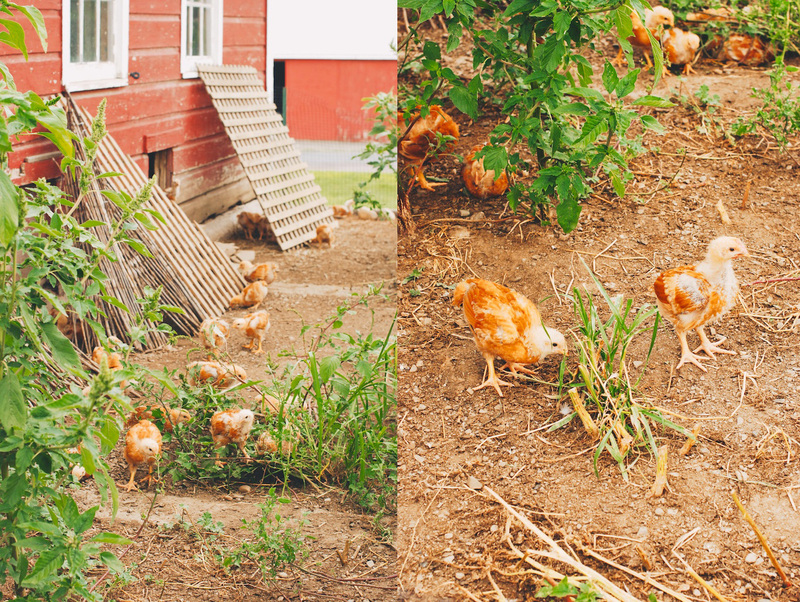 They are perfect for summer, perfect for that bumper crop of zucchini and an influx of sweet corn. They come together without much fuss, and are easily reheated for a quick meal a few days after. I served mine with a tomato-and-many herb salad, but a fried egg or sliver of nutty cheese, a paper-thin slice of salt-cured ham or a leaf of smoked salmon, would not be unwelcome. This batch yields about 12 fritters; feel free to scale up if you want to. 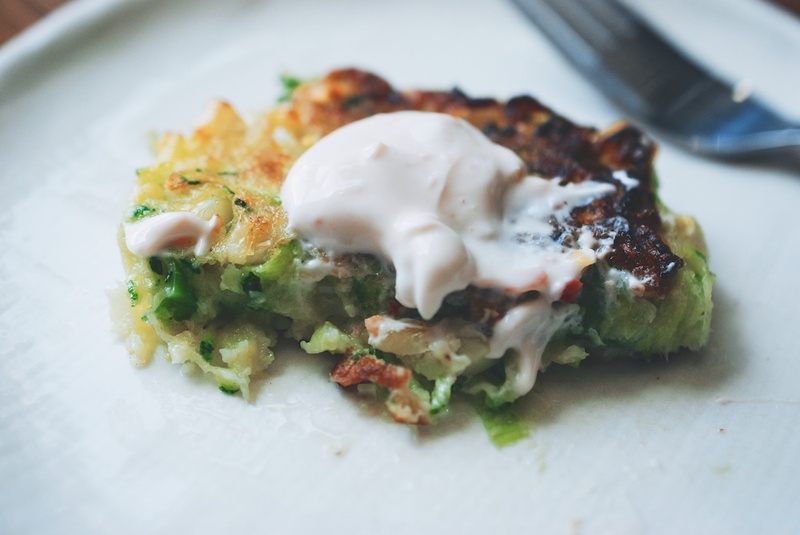 Recipe adapted from Smitten Kitchen’s Zucchini Fritters. Trim the ends off the zucchini, and then grate them. 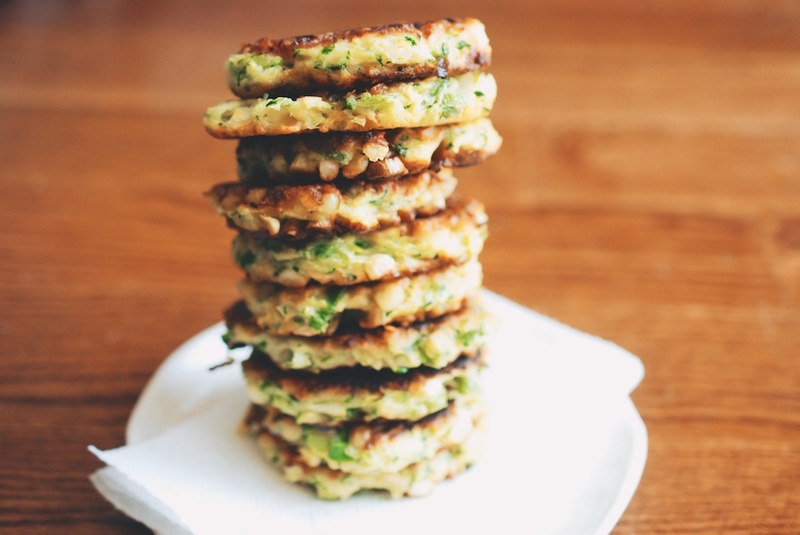 (You can use the shredding disc of a food processor, or the largest holes of a box grater.) 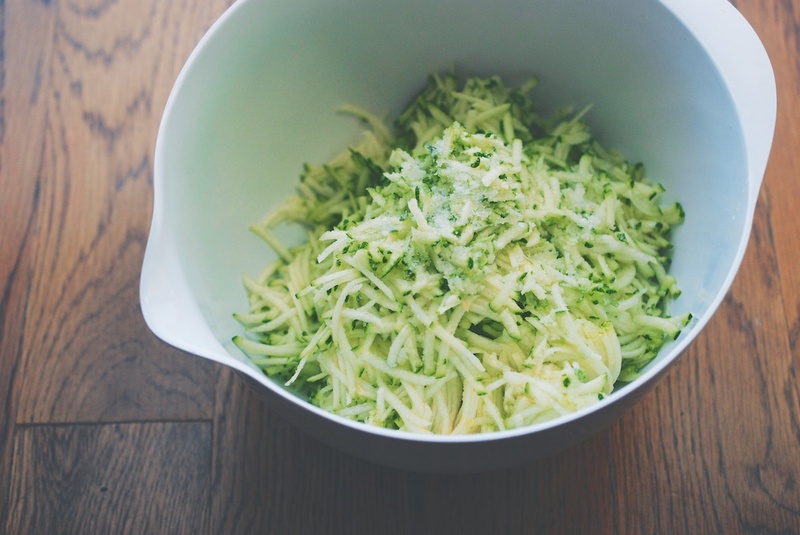 Move the grated zucchini to a large bowl, and stir in 1 teaspoon of the kosher salt. Leave the bowl alone for 10 minutes. After 10 minutes, the zucchini should have given off some water. You want the zucchini as dry as possible before cooking. You can: drain the zucchini in a colander (using the back of a spoon to push out the water), or wrap it in cheesecloth, or (my preferred method) you can wrap the zucchini in a clean dishcloth and twist, twist, twist. Either way, when the zucchini is as dry as you can get it, wipe out the large bowl, and move the zucchini back into it. 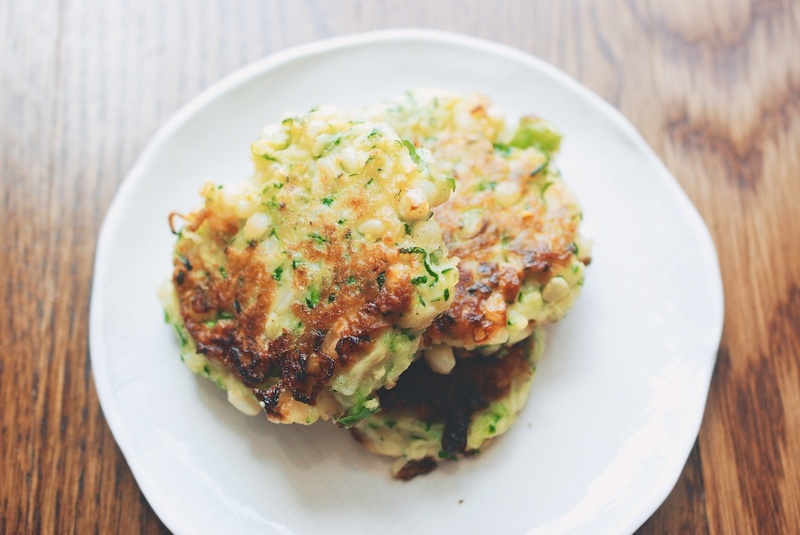 Now prepare the other fritter ingredients: Shuck the corn. Cut the kernels from the cob, and add them to the mixing bowl. Wash any dirt away from the scallions, and then thinly slice them; add them to the bowl. Crack the egg into the bowl, followed by several cracks of freshly grated black pepper, the lemon zest, and the remaining 1/2 teaspoon kosher salt. Use a spatula to fold everything together. In a small bowl, whisk together the baking powder with the flour. 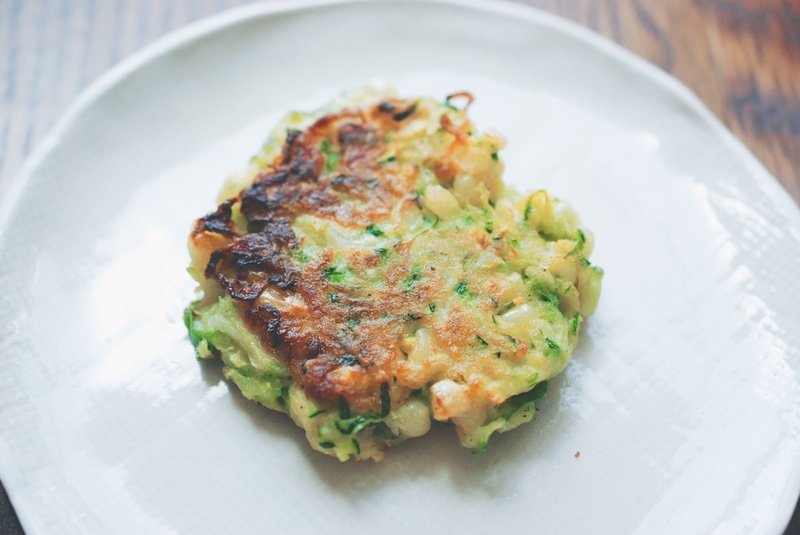 Then use your spatula to fold the dry ingredients evenly into the zucchini mix. Heat the oven to 200F. Heat the olive oil in a cast iron (or very heavy) pan. Turn the heat to medium high-ish, and let the oil warm up, until it sputters when you flick water across the surface. Meanwhile, form the zucchini mix into patties, about 2-3 inches in diameter. 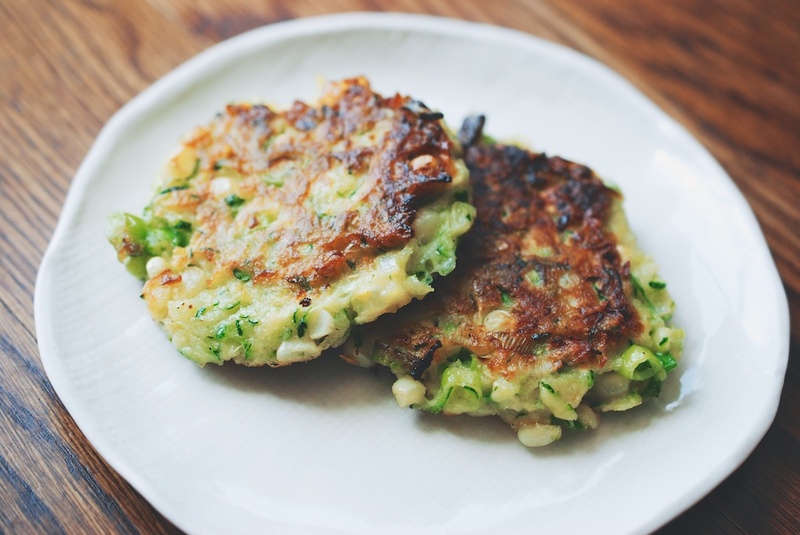 Cook the patties for 3-5 minutes per side, until they’re crisp and browned on both sides. (I did mine in two batches, so as not to crowd the pan.) 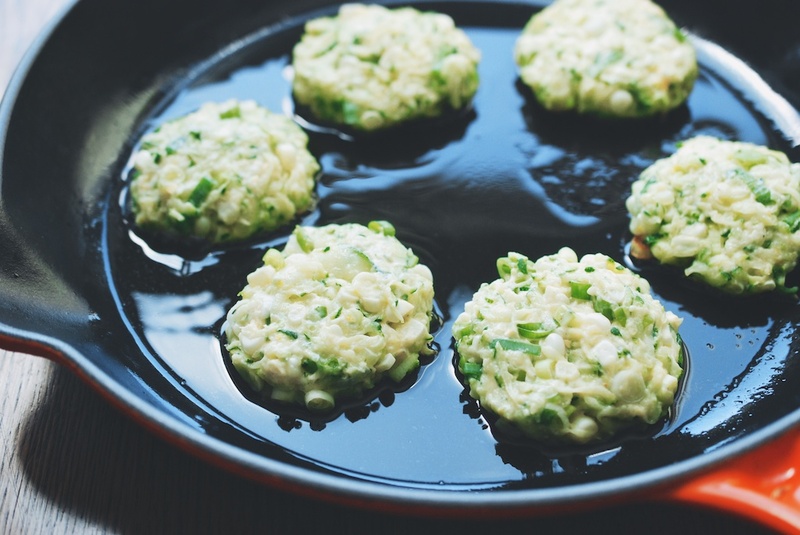 As soon as the fritters are cooked, move them to a baking sheet and into the oven, just to keep them warm until serving. 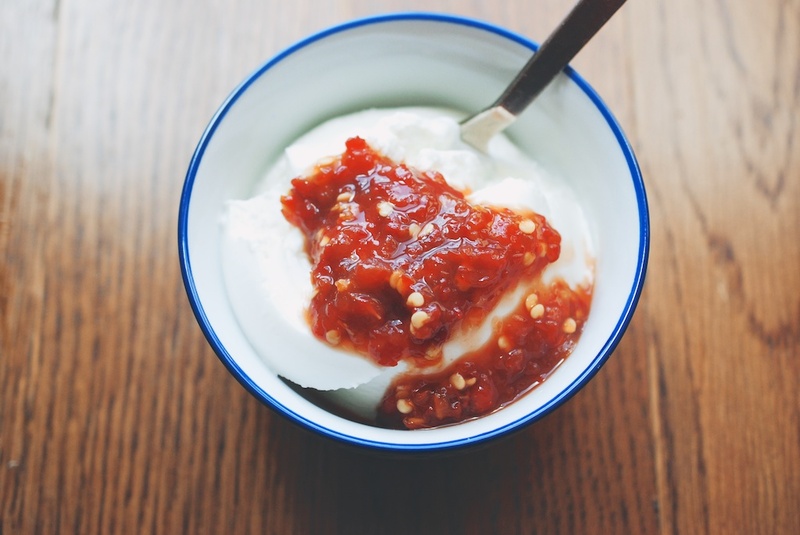 In a small bowl, stir the sambal oelek into the Greek yogurt. Serve alongside the fritters. Hi Christina Not only is this recipe absolutely amazing also is your blog! Kind of in love with the design and the pictures Please keep on posting! I love how youmuse your words in your articles. I,will surely be reading all these posts here. Blessings. This looks like a terrific recipe! I have one very large zucchini sitting in my fridge waiting for inspiration. Now I know its fate. Thank you! I love your blog. 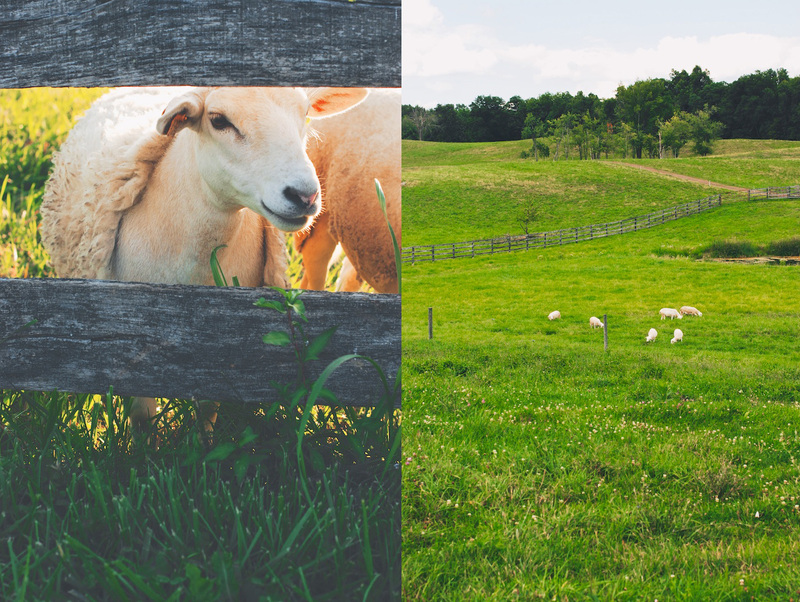 The photos are wonderful and your adventure at the farm sounded great. Your photos are beautiful! 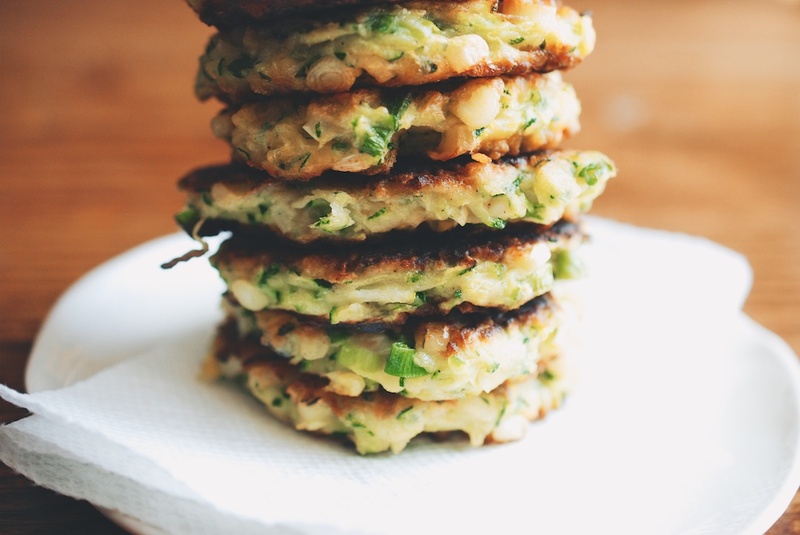 I can’t wait to try these fritters.